Intelligent Coatings for Corrosion Control covers the most current and comprehensive information on the emerging field of intelligent coatings. 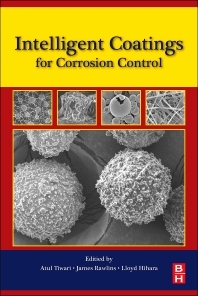 The book begins with a fundamental discussion of corrosion and corrosion protection through coatings, setting the stage for deeper discussion of the various types of smart coatings currently in use and in development, outlining their methods of synthesis and characterization, and their applications in a variety of corrosion settings. Further chapters provide insight into the ongoing research, current trends, and technical challenges in this rapidly progressing field. Materials scientists, chemical engineers and corrosion experts working in the coatings area; researchers and graduate students. Dr. Tiwari specializes in the development of novel materials, such as coatings for corrosion protection, bio-inspired biocompatible materials, hybrid materials for fiber reinforced composites, graphene films and coatings. He has invented seven international patent-pending technologies that have been transferred to industries, including a unique non-carcinogenic corrosion protection coating SiloXelTM that is targeting the $300 million non-chromate conversion coating market. He has been actively engaged in various fields of polymer science, engineering, and technology and has published several scientific peer reviewed journal papers, book chapters and books related to material science. He is an active reviewer of several leading international journals and acts as associate editor of the journal Advances in Chemical Engineering and Science. Dr. Hihara is Professor of Mechanical Engineering at the University of Hawaii at Manoa. He has a Ph.D. in Metallurgy from M.I.T. Dr. Hihara’s research interests include corrosion behavior of advanced materials in Hawaii’s micro-climates, corrosion behavior of SiC/Al, boron carbide/Al, alumina/Al, and Si/Al metal-matrix composites, corrosion of microelectromechanical systems, and materials compatibility of metal alloys coupled to polymer-matrix and ceramic-matrix composites. He has published extensively in the areas of corrosion science and coatings. Dr. Rawlins is an Associate Professor in the School of Polymers and High Performance Materials at the University of Southern Mississippi. From 2000 to 2004 he was Senior Research Chemist/Technical Marketing Manager of Powder Coating Raw Materials at Bayer Corporation. He owns more than ten patents, including several in the area of coatings. His research interests include polymer design for thermosetting systems; polymer-coated surfaces; polymer interpenetrating networks; compatible and incompatible blending in crosslinked polymer systems; forensic analysis of polymers, coatings, adhesives, fibers, films; Structure property-relationships with crosslinked polymer systems; raw material development from natural and renewable resources; chemical and biological agent permeability with crosslinked systems, and intelligent and responsive polymers. Dr. Rawlins has a Ph.D. in Polymer Science and Engineering.